Feeling bad and looking good is an art form. Doing it while you are at the bottom of the socio-economic ladder is doubly hard! How to do? The red top is from the Gap a million years ago–it was probably around $30. The necklace I just got from Target–it was $10. The earrings are from Wolfbait and B Girls–a local artist’s and designers consignment shop. There were around $38 with my generous (Thank you girls!) “neighborhood discount.” You cannot see my bottom but I am wearing a wonderful graphic black and white skirt from Target–$25. The tights are from American Apparel–around $18. The socks from who knows where? The hair–mom and dad! The rain helped the curls come out so there is some advantage to living in the city that has the worst weather IN THE WORLD bar none, except maybe Lodz, Poland or somewhere in the beleaguered Ukraine. Speaking of Ukraine, Putin will dive in next to wipe them out of their illusions of freedom; the Crimea was just an appetizer. So after he got his muscle back from the Olympics he wants to flex, doesn’t he? I would like to guide you, invite you, entreat you– to read my story in the short story section. This deals with the Putin phenom a few years back, when he murdered Anna Politkovskaya, the Russian journalist and activist who openly opposed the Chechen conflict and Putin as well. She reported unflinchingly from Chechnya, but it seems that was just a warmup for present events. I wonder what her ghost is saying now! At any event, what has this to do with beauty, design, clothing, fashion and me? Not a whole lot, but I just feel better when I look better, even when I am feeling bad. Perhaps it is from my mother who died at age 61 dressed in a silk blouse and pearls. Perhaps it is the “egoic self” as Eckart Tolle would surely label it, perhaps it is insecurity, or too much obsession with the superficial or god knows, whatever! I think it’s just fun! I tell people I am a flower. You don’t ask a flower why does he or she look good or wonderful or pretty or colorful do you? A flower is just a flower! It blooms, it flowers, it enjoys the moment. I don’t question that for myself. I love color, I love fashion and putting things together, I love using my body and my hair and my face as my palette–it is all I’ve got, after all! So for me, I am the canvas which I paint each and every day–no matter how hard it is or how bad I feel! I mean, today I have a bad cold I got from my daughter’s dog Lolie, who I stayed with for 5 days while she was out in LA visiting my son-in-law who is working on this wonderful new show on Amazon with Jill Soloway entitled Transparent. Watch the pilot–it is stellar! SO, anyway, there I was in her wonderful beautiful apartment with this rather demanding, unaffectionate, finicky old dog that poops and pees all over the place numerous times no matter how much I take her out, who is curmudgeonly, grumpy and often unfriendly! She has a way of getting right underneath your feet to let you know she’s there but when you go to pet her she backs away like you are about to hit her. She’s got the demand and guilt inducing behavior pattern right down. And then when you are asleep she poops in the dining room or the living room, even though I was taking her out 4 times a day! OY. Meanwhile, this stay she was sneezing, sneezing, sneezing and coughing and chuffing and coughing and chuffing–and yes, I got her cold. Then I got sick and the two of us were a right nasty pair of grumpy old women. I feel for her. She’s 80 or 90-something and Lord knows, I probably won’t live that long, but if i did, knowing my “glass is half empty” mentality, I’d be a grumpy old woman too. However, it doesn’t make it any easier that the lovely apartment is at the top of the building–that I like–up 3 double flights of 45 degree inclined stairs. Up and down. Up and down. Please don’t tell me this is good exercise. I already know. But it does get tiring. This morning I packed up and said our goodbyes and came home, turned on my humidifier and got dressed up to take a picture for this blog! 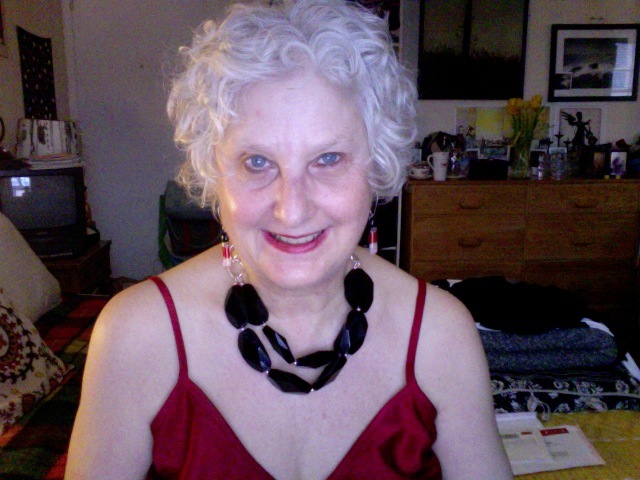 Of course, the Dalai Lama or Pema Chodron, my role models and mentors, are not dressing up in earrings and spaghetti straps are they? I am. What kind of Buddhist am I? I chastise myself, but to no avail. I am the kind of Buddhist who likes to dress up and smile for the camera. quello e appena il modo che e.